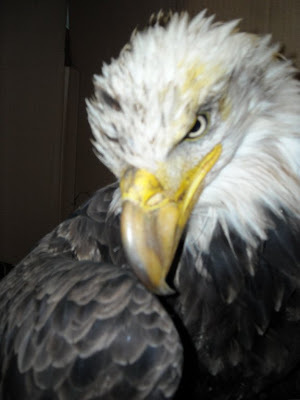 Last night I promised to write about the Bald Eagle Lance and I rescued in Post Lake, WI just hours earlier. She is a four year old female. She weighs just 7.12 lbs. Female should weigh up to 12 or 14 lbs. in our region. Starvation occurs in birds with lead poisoning because the digestive system slows or stops working. She was in such critical last night, we didn't weigh her until this morning. By then she had been given fluid to rehydrate her. That means she weighed less than 7 lbs when admitted. When working with wild birds excessive handling and manipulating may actually cause their immediate death rather than save it due to stress. We are careful to do only the things that will be life saving when admitting birds in such delicate condition. 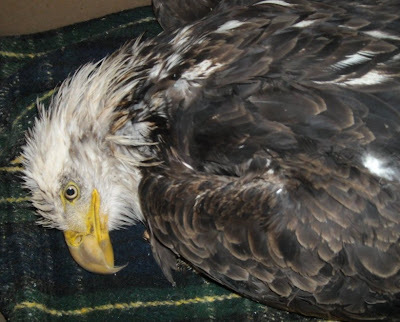 We suspected from the eagles behavior and level of starvation that she was suffering from lead poisoning. We drew blood work from her on admission. 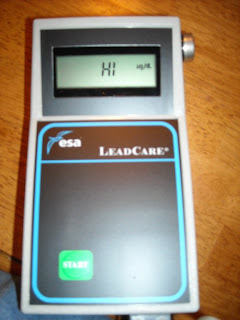 Sadly, we deal with so much lead poisoning in wild birds here in northern Wisconsin, we have our own lead analyzer. In this way we are able to get results back within an hour and begin treatment. It can take four days or more to get results when blood samples are sent out to a commercial laboratory. We continue to battle for her life. Today she seemed to be doing better. Her breathing was regular. She was no longer making raspy sounds when taking a breath. She is on antibiotics for pneumonia and Ca EDTA to chelate her blood of the lead. Tonight, she has taken a turn for the worse. Much of the progress made during the last 24 hours has gone backwards. She is on heat, but her body temperature is dropping. That indicates her body is trying to shut down. Our job is to try to trick her body into continuing on with artifical heat and other supportive care. I am trying to remain optimistic but the statistics are not in her facor. It will be another long night. 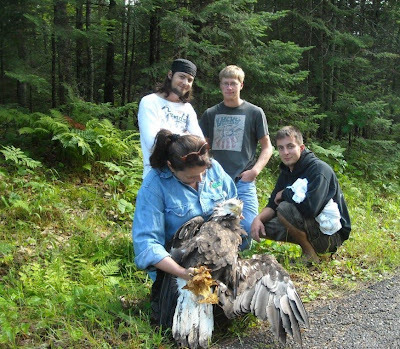 Lead poisoning is a human caused problem in native wildlife. It seems at least to me, it is also a human responsibility to correct the issue. That is true especially now that we are aware of the toxicity to all life including our own. Still, there are strong lobby's for the "rights" of humans to use lead ammunition and lead fishing sinkers etc. Many do not believe it is a problem at all but something environmentalists have trumped up. One day here at REGI would change their mind. But,it is easier to close their eyes and repeat phrases others with profit margins offer. A sad commentary on our species. I wish we took the rights of the wild ones we share our world with seriously. Maybe someday we will. I hope so. So, I will sit tonight alone, keeping this stunning female Bald Eagle comfortable in hopes that the CA EDTA will grab enough of the lead from her blood to make a difference, allow her to live and be free once more. Where are the folks now that doubt that lead is a toxin? They are certainly not here and not with us in this struggle. I am with her because she may go into convulsions. If she does she will have to be restrained so she does not break her wings or aspirate. Lead poisoning is ugly. You can see in the photos above that her habitat, her home, is beautiful. How was she to know it held hidden dangers that could kill her? This is not an isolated case. 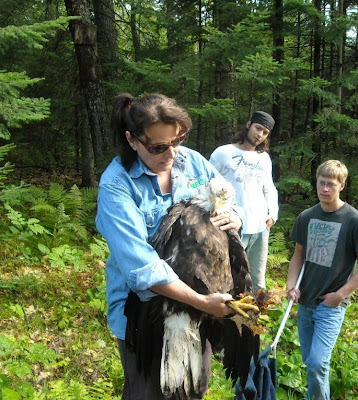 It is not one Bald Eagle in the entire northland that became lead poisoned. We see so much lead poisoning in many birds including Trumpeter Swans and even a Mallard Duck came in with lead poisoning this week. Sometimes people disappoint me. This is one of those times.